Natural stone countertops can help enhance kitchens, bathrooms and bars in the home. Although granite is one of the most frequently used countertop materials, sometimes a homeowner will wish to use a more exotic stone. With its fragile, translucent coloring, onyx is one of the more exotic natural stones on the market today. Frequently available in smaller slabs, onyx can be installed in areas that do not get a lot of use. Its cost range can be double or more that of granite, however. 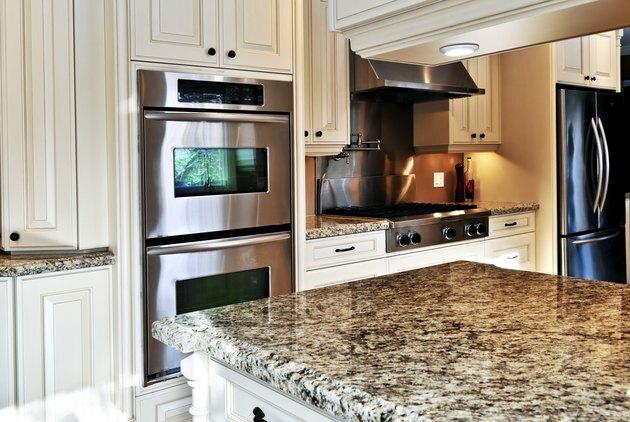 Granite is a durable stone, perfect for countertops. Granite is an igneous rock, formed primarily of quartz. This stone is extremely hard, durable and able to withstand hot pots, knives and daily use. Like other natural stones, granite is variable in color, might contain fissures and should be cleaned with stone cleaners as well as sealed regularly. Onyx is a form of marble, comprised mostly of calcite. Like other marbles, onyx is much softer than granite and is likely to stain or etch. Unlike other marbles, onyx is translucent and can be lit from behind to showcase its beauty. Onyx is an extremely variable stone with heavy veining. No two pieces of onyx are ever exactly alike, and one slab might contain dozens of colors. Onyx slabs are not as large as granite slabs because the material is much more fragile and unlikely to be extracted in such a large block. Like any natural stone, granite should be cleaned with stone cleaners and sealed to help impede staining. Granite is extremely dense, though, and many types of granite need little to no sealing at all. Granite can withstand heat, force and knives, making it perfect for kitchen countertops, as well as bar tops and bathroom vanity tops. Care should be taken not to subject granite to acids or vinegars, and spills should be wiped up in a timely manner. Onyx can be marked easily by knives, pots, cleaning elements and acids. Therefore, onyx should be used in low-traffic areas or low-use areas. Bathroom vanity tops and some bar tops that do not get a lot of use can be complemented by the colors and veins of onyx. Toothpaste, moisture from glasses and foods should be wiped up as quickly as possible to prevent marking the stone. Onyx always should be cleaned with a stone cleaner and sealed regularly to impede staining. Granite can be sedate or a wild-appearing stone. Colors of granite can range from black to green, red and blue, and the stone can be tightly flecked in pattern or contain large veins. Like all natural stones, granite will vary widely from piece to piece and within one piece, although some stones are quieter in appearance than others. The patterns of granite can help to disguise debris and fingerprints, helping it to appear clean. Onyx is a light and variable stone. You can place undercounter lighting beneath this translucent stone to show off its color and beauty. Onyx is available in colors ranging from golden yellow to pink, blue, green and red. Onyx is extremely variable and can range not only in color but in pattern as well. Some sections of onyx might include streaks of color that are not present in other sections. Onyx has an exotic and fragile appearance that can complement many modern and contemporary designs, particularly when back-lit.